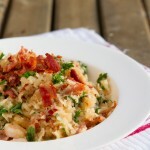 A light low-carb risotto with shredded daikon, a mild radish that acts similarly to rice when cooked. 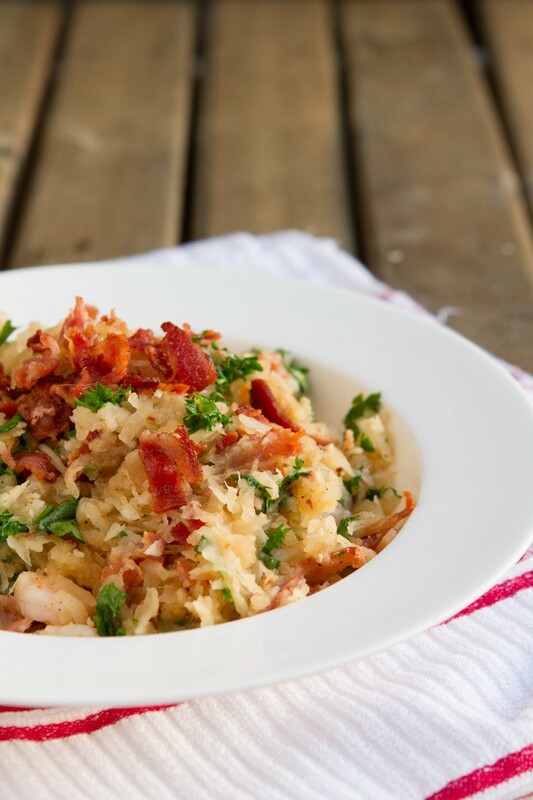 Topped with crispy bacon and fresh parsley. Once daikon is shredded and weighed, ring out as much water as possible. Heat a saucepan on medium heat. Chop bacon slices and add to pan, frying until crispy. Remove with a slotted spoon and place on a clean plate, leaving bacon drippings in pan. Add shredded jicama or daikon, wine, stock, garlic, salt and pepper to the pan. Cook on high until most of the liquid has been dissolved, 6-8 minutes. Stir in shrimp and fold in bacon, reserving a few pieces for garnish. Stir in parsley. Serve immediately. Daikon: can also be found under the name “Lo”. If you cannot find it, shredded cauliflower or jicama can be used in its place. Shrimp: if you are sensitive to shrimp, feel free to replace with extra bacon or pieces of cooked chicken thigh.